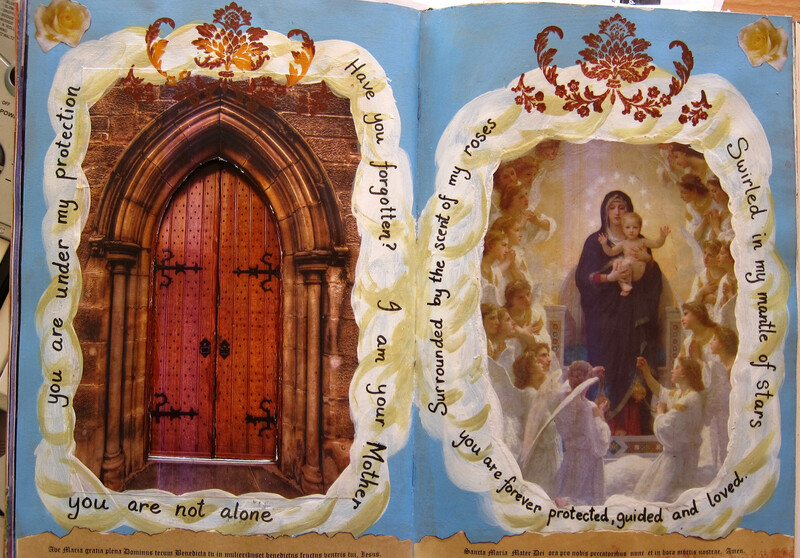 A while ago in our art journaling class with Zom we made some pages with either a door or a window opening through to the next page….or at least, like most pages I’ve done, we started them in class and finished them at home. Here are my pages, first with the door closed, then with it open so you can see through it to the page behind. This was the first page I had done with a black gesso background, but it won’t be the last. I love the way the pictures seem to arise out of the darkness. The words are from the “Charge of the Goddess”. I printed out 2 copies of the medieval door and stuck one directly on the other side of this one, so the door opens from both sides of the page. When the door is open you can see the gorgeous painting of the “Virgin with Angels” by Bouguereau which I think is my favourite painting of Mary. I cut the Goddess stamp from an eraser. As you can see I was going for a lighter, more “heavenly” look here with sky blue and white clouds. Actually I didn’t really like the circle of clouds once I had done them, partly because I mixed the paint with a Flow medium by Jo Sonja’s which turned out to be gloss. Yuck, I hate gloss in my journal…if anyone wants my Jo Sonja’s flow medium you can have it, I won’t be using it again. What I do love is when you open the door and see the dark goddess with the snake, again, two faces of the Goddess. 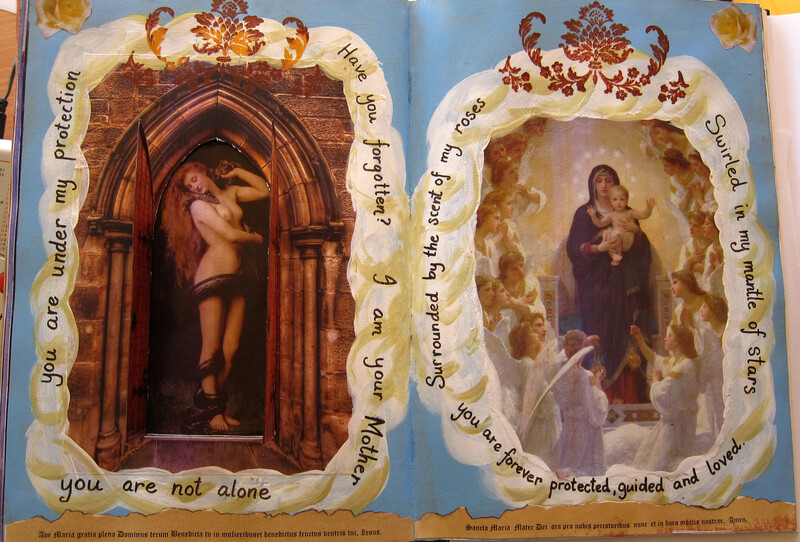 The writing on the left is the message of the Virgin of Guadaloupe as cited in Clarissa Pinkola Estes new book “Untie the Strong Woman”. Being brought up as a protestant (Methodist) minister’s daughter I never had much of a relationship to Mary, we thought that was a weird Catholic obsession, but I found this message strangely moving, “Have you forgotten, I am your mother, you are not alone….” Since I have become more into the sacred feminine in recent years I can feel a closer connection to Mary now than I ever have before. Though I have always loved some of the beautiful musical versions of Ave Maria. Especially the version by Franz Biebl…check it out on youtube sung by Chanticleer…I saw these guys sing this in Brisbane in 1997 and I’ve never been the same since!